The World's Most Honored Motion Picture. The numbers speak volumes: 100,000 costumes, 8,000 extras, 300 sets and a staggering budget in its day the largest in movie history. Ben-Hur's creators made it the best, the greatest Biblical-era epic ever. Charlton Heston brings a muscular physical and moral presence to the role of Judah Ben-Hur, a Jewish nobleman in Palestine whose heroic odyssey includes enslavement by the Romans, a bold escape from an embattled slave galley, vengeance against his tormentors during a furious arena chariot race and fateful encounters with Jesus Christ. Heston's charismatic performance brought him the Best Actor Oscar®; the winner as 1959's Best Picture with the legendary William Wyler earning his third Best Director trophy, the film won a total 11 Academy Awards® - a tally unequaled until 1997's Titanic set sail. But Ben-Hur’s Oscar-influence rests not just with its supreme haul. In addition, the movie provides a virtual blueprint for Academy Award gold that works to this day. Epics continue to rule the Oscar roost, and the more elaborate, the better. Make it extremely long and have it take on a serious topic. Execute it with some flair and bingo - you’re almost assured of Oscar recognition. Okay, it’s not quite such a simple process, but it’s clear that Ben-Hur demonstrates the modus operandi that has helped many films clean up at the Academy Awards. It’s a big, oversized, dramatic film that virtually defines the word “epic”. Ben-Hur is formally subtitled “A Story of the Christ”, but that’s a bit of an exaggeration. Frankly, I want to know who Jesus’ agent is; the guy only makes a few bit appearances in the flick and he gets top billing! Well, he plays a bigger role behind the scenes, I suppose, but for the most part the subtitle seems somewhat inaccurate; while the tale of Judah Ben-Hur (Charlton Heston) parallels that of Jesus, the two only cross paths on a few occasions. For the most part, Ben-Hur offers a somewhat Job-like tale of a man who is tested but remains faithful. However, Benny isn’t really all that devout; his loyalties are more strongly oriented toward people than gods. Sure, religion plays a part, especially toward the end of the movie, but the flick largely shows concentrates on his attempts to find justice for family, represented both by his actual mother and sister and more symbolically by the Jewish people. At the start of the film, wealthy merchant Ben-Hur meets up with long-time friend Messala (Stephen Boyd) for the first time in years when the latter returns to Judea as an official. However, their happy reunion soon goes sour when Judah learns of the poor way that Messala tends to treat his people, and not long after that, Ben-Hur and his family are severely punished for an accident that vaguely threatened a Roman governor. Judah’s mom and sister are imprisoned, and he’s sent into slavery, a fate that virtually always results in death. He gets stuck rowing on a warship, but he eventually escapes during a battle. Ben-Hur saves a Roman bigwig named Arrius (Jack Hawkins) who eventually takes him in as his own and helps Judah’s rise to semi-power. This allows him to ultimately return to Judea, seek out Messala with revenge on his mind, and find his relatives. A film like Ben-Hur can be difficult to critique because of its long-established regard as a classic. Much of the movie’s status is deserved. Ben-Hur virtually defines the phrase “epic” with its flawless production values. It offers some of the most elaborate and expansive sets and locales ever seen, and it embraces a literal cast of thousands. Few expenses were spared to bring this oversized production to the screen, and the meticulous care and detail are always obvious. They go a long way toward making the final product more compelling. While I expected the chariot race to be exciting, I was surprised at how well-executed I found the crucifixion segments that end the film to be. Although Ben-Hur tends to be schmaltzy, that problem seemed largely absent during the climactic segments. Actually, there’s still some cheese on hand, but I still thought the Christ-related parts that finish the movie to seem pretty moving. However, a lot of Ben-Hur seems less than compelling these days. For one, the acting is not especially terrific. 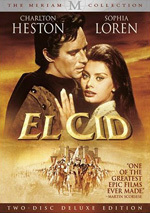 Heston won an Oscar for his work, as did Hugh Griffith for his supporting performance as Sheik Ilderim; neither deserved it. Heston displays a fairly strong presence as Judah, but he can’t manage much else in the role; he seems wooden and stiff throughout most of the film, and emotions other than stark anger clearly are beyond him. As for Griffith, he presents the Sheik as little more than a caricature, and a poor one at that. He makes little positive impression in the part. Although I do applaud the production values, the movie has a tendency to get lost in them at times. It often feels as though the sets and splendor are doing the work of the story. To be frank, the plot is fairly thin for the most part, and there’s not enough there to carry a three and a half hour movie. That means we find a fair amount of filler during the film, as it seems to go on far too long for many segments. The era in which Ben-Hur appeared produced some truly terrific epics; Lawrence of Arabia remains the king of these. As it stands, Ben-Hur is a generally solid film that has a number of positive elements. However, it also contains a lot of flaws that keep it from being a genuinely great work. 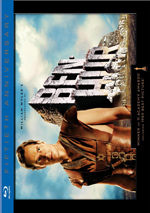 Ben-Hur appears in an aspect ratio of approximately 2.76:1 on these Blu-ray Discs. The package splits the film across two platters. Disc One features the movie’s first two hours, 21 minutes and 52 seconds, while Disc Two runs one hour, 20 minutes, 34 seconds. From start to finish, the movie looked stunning. Sharpness seemed amazing. Despite the many wide shots and the relatively-minuscule nature of lots of onscreen objects, the picture appeared very crisp and well-defined at all times. Even the smallest items came across as clear and detailed. I detected no signs of jagged edges or moiré effects; this was a very stable picture. Colors looked consistently vivid and well-saturated, as all hues were wonderfully portrayed. Reds appeared especially bright and rich. Black levels came across as deep and dense, while shadow detail looked appropriately heavy but never excessively thick; low-light situations were easily discernible at all times. No source flaws marred the presentation. This was a simply stellar presentation without any concerns to be found. Ben-Hur also sounded quite good via the movie’s DTS-HD MA 5.1 audio. The film featured a modestly involving soundfield that helped make the program more compelling. The forward channels displayed a nicely broad mix during much of the movie. Music showed solid stereo separation, and quite a few directional effects came from the sides. These also moved across the speakers and blended together fairly well; the imaging could be a little awkward at times, but given the vintage of the material, the transitions worked well. A modicum of dialogue also came from the side speakers, though this effect was limited; very little speech emanated directly from one channel or the other, and most sounded as though it appeared in a mid-zone between speakers. Surround usage was somewhat limited though it worked well given the age of the film. The rear channels nicely bolstered the score, as they added a strong dimension of reinforcement to the music. During some of the louder scenes, the back speakers also contributed fairly engulfing atmospheric effects. For example, thunder enveloped me, and the chariot race came across very well. Ultimately, the track sounded dated, but it provided a relatively positive soundfield nonetheless. Audio quality seemed positive. Dialogue usually appeared surprisingly natural and warm, and I never detected any problems related to intelligibility. Only a smidgen of edginess interfered. Effects generally sounded clean and realistic, and they sometimes offered pretty solid dynamics; for example, the thunderclaps were nicely deep and rich, and most of the ambient audio seemed crisp. Music appeared quite bright and vivid. Highs usually sounded clear and crisp, and the score boasted some surprisingly well-defined and deep bass at times. For example, the drums appeared quite resonant. The soundtrack to Ben-Hur presented a very positive auditory experience, as given the film’s advanced age. 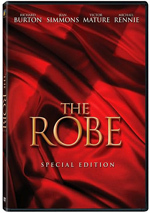 How did the picture and audio of this Blu-ray compare to the 2005 Collector’s Edition DVD? The lossless sound was a bit more robust and smooth, but the most notable improvements came from the visuals. While the 2005 DVD looked good, it couldn’t compare to the killer picture on display here. I felt stunned by the clarity and precision of the Blu-ray’s image. This was an absolutely gorgeous presentation that blew away its DVD predecessor. All of the 2005 CE’s extras repeat here, and we find some new materials as well. On Discs One and Two, we start with an audio commentary by film historian T. Gene Hatcher and actor Charlton Heston. They don’t sit together, and Heston’s parts come from the original 2001 DVD. The actor fills roughly one-third of the movie, and Hatcher covers the rest. At the start, Hatcher discusses Lew Wallace’s novel and its various stage and screen incarnations, MGM’s circumstances at the time and their need for a big hit, and factual/Biblical elements of the film. Much of the time he chats about cast and crew biographies, and he also digs into the nitty-gritty of making the flick. We get lots of notes about shooting issues as well as the background for historical topics. We even receive a nice tutorial about leprosy over the years. Hatcher sags a little at times, but he mostly provides an informative and likable track. Heston also covers a lot of ground. He goes from technical details of the production to anecdotes from the set to notes about coworkers. Some of the same material gets repeated on occasion, but as a whole, Heston manages to keep most of the track fresh and compelling, especially when we get to the chariot race; Heston becomes most active at that time, and he adds a lot of solid remarks. He spends a little too much time telling us how good different actors and scenes were, but I really liked the commentary nonetheless, as it provided a strong look at the film. The two pieces mesh neatly and add up to a solid track. Also spread across Discs One and Two, we find an Isolated Score. This presents all of Miklos Rozsa’s music in stereo. Isolated scores don’t do much for me, but I know some people appreciate them, and I’m glad we get Rozsa’s work here. Disc One includes Theatrical Trailers, where we get five ads. The disc presents 1959 promos for Loew’s Theater and the standard theatrical trailer. It also shows two 1961 reissue clips and a 1969 70mm re-release ad. Disc Three contains the bulk of the extras. We start with the 1925 Silent Version of Ben-Hur. The film runs 143 minutes, six seconds. This edition is interesting to see as a curiosity, though it doesn’t entertain terribly well. Actually, it seems pretty advanced for its era, and it’s clear that the 1959 version borrowed some elements from it. The pair follow fairly similar story paths until toward the end, when they begin to differ more strongly. The later film works substantially better, and not just due to the use of audio. The 1959 movie offers a more subtle experience; 1925’s Judah is a simpler character, and the other personalities lack much nuance. On the other hand, the 1925 Hur gets away with some graphic content not found in the 1959 version, especially during the sea battle. Again, I thought it was fun to see the silent film and it makes a great addition to this set, but I wouldn’t want to watch it twice. Next comes a fine 1993 documentary called Ben-Hur: The Making of an Epic. Narrated by Christopher Plummer, this 58-minute and 15-second program provides a solid look at the history of the project. It covers the story’s origins in the 19th century and follows it through earlier stage and screen presentations. We learn a surprisingly detailed account of the 1925 film edition’s creation. Of course, the show also discusses all the important elements related to the filming of the 1959 version well. It offers a lot of compelling information about cast, crew, story, script, locations, sets, stunts, music, effects and pretty much everything else you’d want covered all the way up to the flick’s release. It does so through film clips, outtakes, behind the scenes material from the set, and interviews with film historian Rudy Behlmer, author Gore Vidal, MGM executive JJ Cohn, actor Ramon Navarro, director William Wyler, director’s daughter Catherine Wyler, editor Ralph Winters, art director’s son Edward Carfagno Jr., special effects director Richard Edlund, composer David Raksin, stunt man Joe Canutt, and second unit director Yakima Canutt. It’s a frank, funny and informative piece that kept me consistently involved and entertained. A documentary entitled Ben-Hur: The Epic That Changed Cinema pops up here. It runs 57 minutes, 46 seconds and includes remarks from Wyler, Heston, film historian Bruce Crawford, producer Arnon Milchan, directors George Lucas, Ridley Scott, Robert Dalva, Ernest Dickerson, and Irvin Kershner, film editor/sound designer Ben Burtt, actor’s son Fraser Heston, production designs Anthony Pratt and Arthur Max, composers Elia Cmiral and Don Davis, cinematographers Caleb Deschanel and Janusz Kaminski, costume designer Sharen Davis, editor Joel Cox, and actor Michael Douglas. “Epic” looks at Ben-Hur through modern eyes. The participants discuss what they like about the movie and relate the ways it influenced their work as well as the industry as a whole. This means introspection about a mix of production elements like sets, cinematography, lighting, costumes and stunts. At its best, “Epic” provides a rich examination of the film’s impact. It’s one thing to know that Lucas and Scott borrowed from Hur, but it’s another to hear them chat about it. The technical workers offer good notes about the flick’s innovations and they way they do their jobs. That said, “Epic” often degenerates into little more than praise. We get a lot of fairly generic happy talk throughout the show, and this makes it tedious at times. I like some of the content, but the program peters out a little too frequently. For a collection of stills and a few other materials, we go to Ben-Hur: A Journey Through Pictures. This running five-minute and nine-second piece shows production and publicity photos as we hear music and audio from the film. We also see other bits like drawings, musical charts and ads along with a few movie clips and a behind the scenes snippet or two. I’m not wild about the format and don’t think this is a particularly effective program. In Screen Tests, we see longer examples of some of the material found during the “Making of…” documentary. We get footage with Cesare Denova as Ben-Hur and Leslie Nielsen as Messala; these last a total of six minutes and 55 seconds. Nielsen shows up again in a silent 11-minute and 22-second piece that pairs him with Yale Wexler as Judah. Next we get George Baker as Ben-Hur and William Russell as Messala. Their segment runs five minutes, 32 seconds. We also find a silent five-minute and four-second snippet from the make-up test for Haya Harareet, the actress who ultimately played Esther in the film. These pieces offer a fun little historical element. In the Vintage Newsreels area, we locate six clips. These run a total of nine and a half minutes through the “Play All” option. We see premieres in NYC, LA, DC, Tokyo, and a summary of the Oscars. The first short shows Heston as he greets moviegoers in New York. That one’s the most fun, though as a local, I like the DC clip since it gives us a good look at the legendary Uptown Theater. For the final archival component, we find Highlights from the 4/4/1960 Academy Awards Ceremony. It fills nine minutes, 43 seconds and shows many of the evening’s award presentations. The sound cuts in and out to cause a few problems, but most of the program comes with sound. This offers a better look at the ceremony than the usual newsreel, so it’s worth a look. All of the prior extras showed up on the 2005 DVD. New to the Blu-ray, we find Charlton Heston and Ben-Hur: A Personal Journey, a documentary that runs one hour, 18 minutes and six seconds. 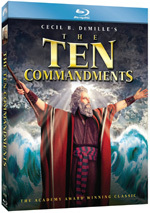 It includes notes from Charlton Heston’s son Fraser Heston, actors Stephanie Zimbalist, Julian Glover, Hildegard Neil and Tom Selleck, Heston’s daughter Holly Heston Rochell, Heston’s wife Lydia Clarke Heston, William Wyler’s daughters Catherine and Melanie Wyler, filmmaker Mike Newell, producer Peter Snell, author/film historian Jon Solomon, Heston’s grandson Jack Heston, and stuntman/double Jon Canutt. “Journey” looks at Heston’s life and family, with an emphasis on the Ben-Hur period. Much of this offers an appreciation of Heston, as you’ll hear lots and lots of praise. We still find some decent information about the movie and the actor, though, so there’s valuable content here. It’s just not the deepest documentary one will find. Two non-disc-based components pop up here as well. A 64-page Collectible Book delivers a mix of images and text. We get basics about the story, characters and production along with quite a few photos and other visual elements. We see movie stills, shots from the set, and PR images as well as some test pictures and design art. The text doesn’t tell us much, to be honest, but the book presents the visuals well. On the Set of Ben-Hur provides a 128-page “personal journal of Charlton Heston”. After an introduction from Heston’s son Fraser, we get exactly what the premise promises: daily entries in Charlton Heston’s journals. These start on January 15, 1958 and continue through April 15, 1960. The first one finds Heston right before Ben-Hur’s pre-production, while the final one shows his reactions to the Oscars. In between, we get all sorts of information about Heston’s experiences related to Ben-Hur. The format differs from a standard journal, as Heston didn’t just jot notes onto blank pages. Instead, we see his date book; it shows his schedule for each day along with typewritten journal notes at the bottom. This is a cool way to keep track of events, as we can glean a lot from the date book listings as well as the more free-form writing. A few other pieces show up in “On the Set”. We get a reproduction of a ticket to the film’s London premiere, photos shot by Heston’s wife Lydia, sketches by Heston himself, and a biography of the actor. I really like “On the Set”, as I think it’s an unusual and fascinating extra. More than 50 years after its initial release, Ben-Hur remains the definition of a screen epic. As a film, it still has a lot to offer - particularly in the excellent chariot race sequence - but some other elements haven’t aged quite as well. The Blu-ray delivers stunning visuals, excellent audio and a quality set of supplements. Without question, this is the greatest version of Hur to hit home video; fans will be ecstatic over the way in which it presents the film. Regardless of age, you’ll be hard-pressed to find a better-looking Blu-ray. Unfortunately for those fans, that upgrade currently comes at a pretty steep price. As initially released, the Ben-Hur Blu-ray exists only as the “Ultimate Collector’s Edition” detailed in this review. If you want to get the movie on its own without all the bells and whistles – and this set’s nearly $65 list price – you’ll have to wait. How long will you wait? That I can’t say, but I suspect a cheaper Ben-Hur Blu-ray will eventually emerge. Casablanca also debuted on Blu-ray as a UCE; the standalone Blu-ray came out a bit less than a year later, so I’d guess that’s probably the same timetable for a cheaper Hur. 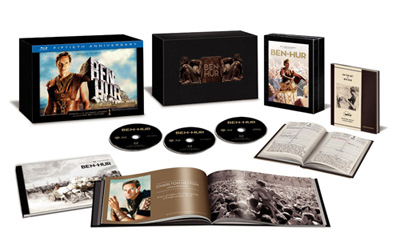 I do really like the Blu-ray Ultimate Collector’s Edition, but I understand that it’s pretty expensive, especially since it doesn’t add many new supplements to the party; other than the “Personal Journey” documentary and the paper materials, everything here appeared on the 2005 Ben-Hur DVD. If you’re a serious Ben-Hur fanatic or you just can’t stand to wait indefinitely for a standalone Blu-ray, go for the UCE. Otherwise, I suspect your wallet will be happier to hold off until a less pricey version hits the shelves.